South of Aldborough, three medieval churches sit in a line along the Holt to North Walsham road, each about half a mile apart and all very different from each other. 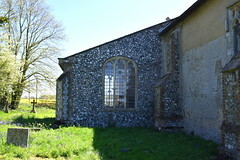 The middle one is the lonely church of All Saints, Thwaite. Thwaite church is a landmark, its round tower peeping above the trees. There is no Thwaite village. 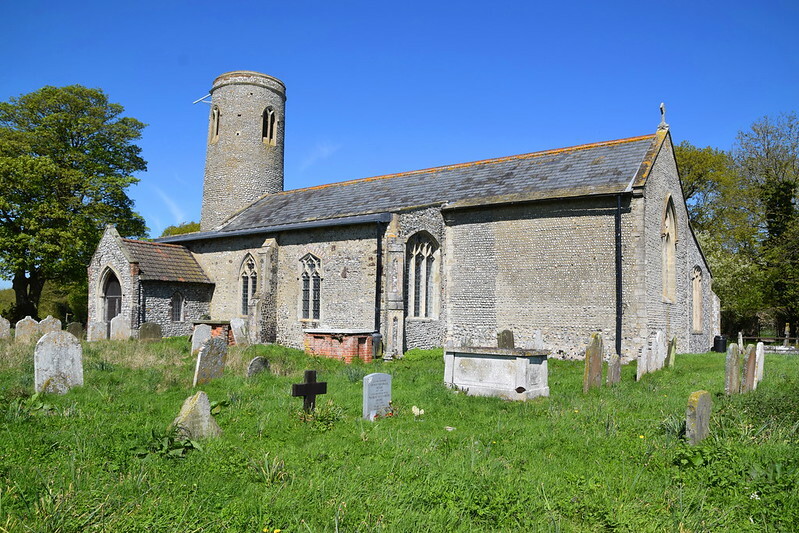 The church sits at the highest point in the road, and the view from the churchyard is wide and open to the south, all high Norfolk spread out before you. The tower probably dates from the 12th century, with bell openings of a century later. 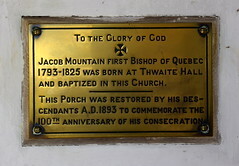 It was built against an already existing church, although the defining features of that church now are newer. 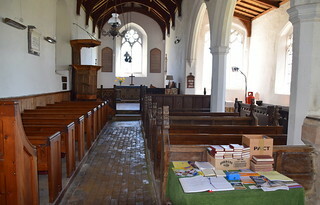 The south aisle can be dated by will evidence as from the 1440s, but it was the early 19th century which brought the large school room built onto the north side of the chancel. 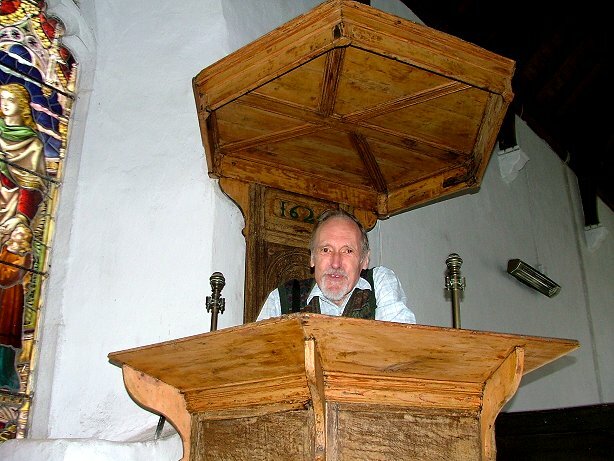 You step into a church which is entirely rustic, a real church of the common people, with a brick floor and a font pressed in the medieval manner against a plillar of the arcade. 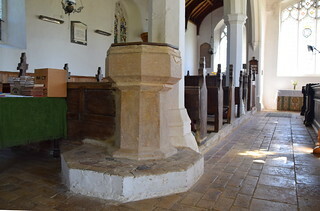 The south aisle is full of light and old benches. 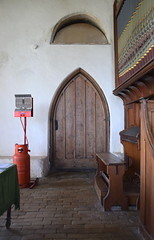 The cut-down screen has deeply cut tracery painted red, gold and green. 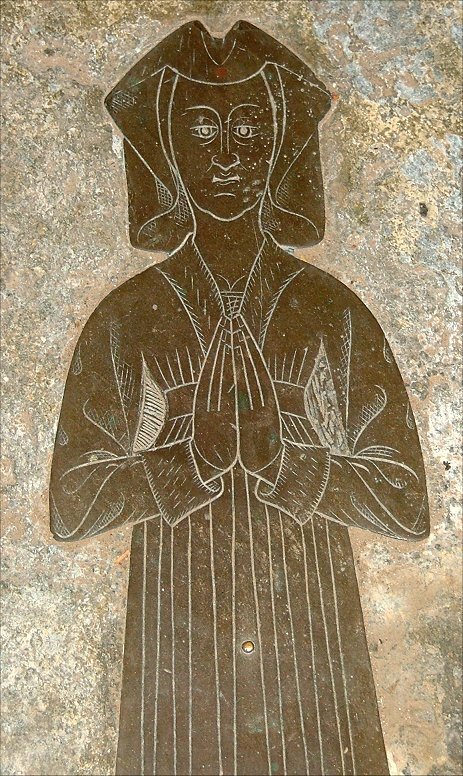 Mortlock detected the hand of the Aylsham screen maker. 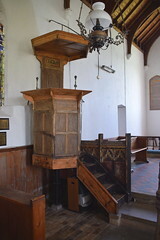 The beautiful pulpit with its tester is dated 1624 in a large inscription on the backboard. 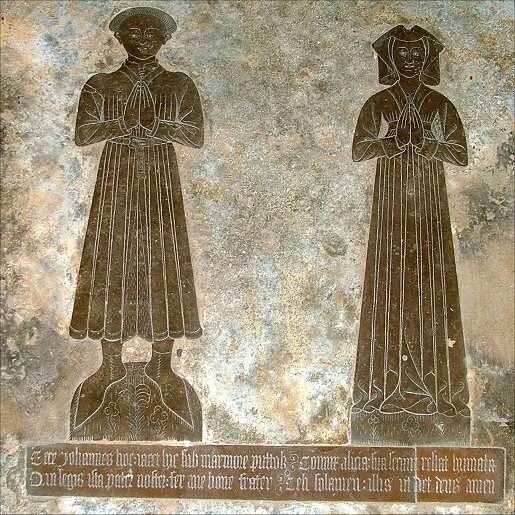 Best of all, and to be expected in this part of Norfolk, a fine figure brass, a double one, to John Puttok and his wife. Interestingly, they died almost thirty years apart, Puttok first in 1442. 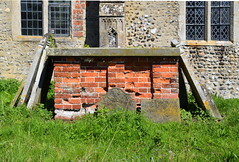 The previous year, there had been a bequest for the building of the south aisle, and Puttok's will of a year later asked that he should be buried in it. Was it already built by then? Whatever, that is where the brass is now. 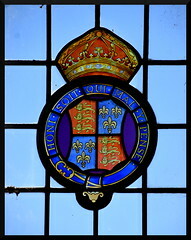 The east window of the south aisle has a modern glass depicting the crowned Tudor royal arms of England and France. It probably came from the same collection as at neighbouring Alby. Faith and Charity are rich and elegant in the mid-Victorian manner in the nave, but the chancel is full of simple white light, and less cluttered and complex spaces than this chancel would be hard to find. 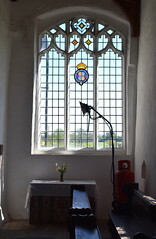 If you have come here after enjoying the gorgeous Anglo-catholic riches of the churches to the south, this church will feel like a breath of fresh air.